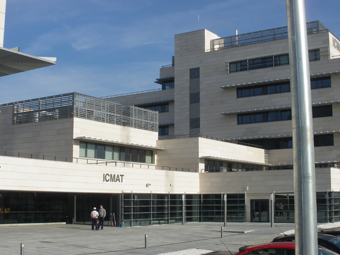 ICMAT, Institute for the Mathematical Sciences (CSIC-UAM-UC3M-UCM), Madrid, Spain, December 17-19, 2012. Here is the list of abstracts of the short talks. Here is the list of poster abstracts. Here is the most updated information. This is a tentative shedule to make easier the travel arrangements. It will be updated as the workshop gets closer. Unfortunately, we will not be able to provide any financial support. However, we will cover coffee and lunch expenses during the three days workshop. This hotel is located a few metres from Chamartín train station, which is two stops away from Cantoblanco campus where the conference will take place. All rooms include their own bathroom, television and wifi. Double room with single use (breakfast included): 65,97 euros/night. Double room (breakfast included): 93,29 euros/night. If you are interested in booking this hotel, please send an e-mail before November 22, 2012 to Miriam [dot] ramiro [at] melia [dot] com with subject: grupo CSIC // Reserva 7898 indicating your name(s), arrival and departure dates, credit card number and expiry date. Hotel San Lorenzo is a three-star hotel which is conveniently located near to Sol in the centre of Madrid. All rooms include their own bathroom, television and wifi. Please check the website to book this hotel. Hostal Asunción is located at ten walking minutes from Puerta del Sol and a few minutes by foot from Plaza de Colón. It does not provide breakfast service. All rooms include their own bathroom and television. Please check the hostal website for special deals. These are a few suggestions. In any case the variety of hotels in Madrid is pretty wide. The easiest way to arrive to the ICMAT from Madrid city is by train: line C4, direction Alcobendas or Colmenar Viejo. The train line C4 stops at Puerta del Sol, Nuevos Ministerios and Chamartín. Get off at Cantoblanco Universidad station and head straight Vicente Tomás y Valiente street. The ICMAT is at the end of this street just on the intersection with Nicolás Cabrera street. Have a look at the map on the right. See this map for a pdf file of the campus. Click here to go to Google Maps' website. The taxi from the airport to ICMAT costs approximately 30.00 Euros. A good option is to take bus 827, direction Tres Cantos, at Arrivals-Terminal 4. The trip to Cantoblanco campus takes around 40 minutes. Get off at bus stop Facultad Informática (Faculty of Computer Science) on Marie Curie Street. Ask the driver to help you to identify the bus stop. If you zoom in the above map, you will see the bus stop icon. The price is 1.75 Euros. Another option is to take Metro from Airport to Nuevos Ministerios. At the airport, take Metro (underground), Line 8 (pink) to "Nuevos Ministerios" (5-7 stations depending on the terminal you arrive to). Transfer in Nuevos Ministerios to train, line C4. Follow the indications given above. The price in total is 3.45 Euros. The long-distance trains stop at Atocha or Chamartín. In both train stations you can transfer to the local train, line C4 as described above. Take the city bypass M-40. If you come from the south, Portugal, or the Zaragoza Highways, take direction North (N-I). If you come from the Burgos Highway (N-I) take the direction M-607 Tres Cantos- Colmenar Viejo. Exit M-40 towards the M-607 Highway direction Tres Cantos-Colmenar Viejo. Exit M-607 towards M-616. At the first roundabout take the first exit. Turn left on the first street and go straight. Turn right on the third street. The building is on your left. Habilitation thesis: Systèmes intégrables semi-classiques: du local au global. San Vu Ngoc. CRM course by San Vu Ngoc: Symplectic invariants of integrable hamiltonian systems. Álvaro Pelayo, San Vu Ngoc: First steps in symplectic and spectral theory of integrable systems. Discrete Cont. Dyn. Syst.32 (2012), no 10, 3325-3377.